Prop: 1066 x 0 mm / 42" x ? Planning for the sidewheel steamboat Margaret S. was started in the late 1970s, but first steaming had to wait until 2010. My Aunt Margaret, a fine woman who was born in 1903 near Rose Bud, South Dakota left me enough funds to build the boat when she died in 2005. Her Father, (my Grandfather) was the Indian Agent for the Sioux Tribe reservation there, where she suffered a total loss of hearing at the age of three due to Rheumatic Fever. She outlived all of her siblings, and was very active within the Deaf Community. Of course I named the steamer after her. We have enjoyed cruising along much of the USA Northeast, from Newport News Virginia to Lake Winnipesaukee in New Hampshire, although most of the cruising has been on lakes, or on the Delaware and Schuylkill rivers near Philadelphia Pennsylvania. The classic Walking Beam Steam Sidewheeler, with a tall simple steam engine rising above the hull, visible to all, is largely the inspiration “Margaret S” steamboat design. The walking beam type of excursion boat was built in the USA for nearly 100 years, and the walking beam engine was retained for propulsion long after this type of engine had become technically obsolete. Passengers wanted to see the walking beam working to drive the ship, and in America, where fuel was relatively inexpensive, the simple steam engine was adequate. The Margaret S. has an engine layout that is generally faithful to the old American Walking Beam Engine, with modern design improvements appropriate to the smaller steamboat technology. The engine frame is a welded structure (vs. a wood or riveted frame on the old steamers), proportioned to match typical historic engines, and embellished with fancy brass machinery finials and support columns, as was typical practice for many sidewheel steamers. For the Margaret S., the engine is somewhat lower than the historic arrangement, in order to secure a low center of gravity which improves stability of the boat. The engine is of a single cylinder double acting configuration, with 3-1/4 inch (83mm) bore, 5-1/4 inch (133mm) stroke, running in the 50 to 60 RPM range at full speed. This engine provides much visual pleasure for steam enthusiasts, with all the links and levers clearly seen, and operating at relatively slow speed. Boiler feed and condensate/air pumps are driven from the beam, as was typical historic practice. The original engines usually had low speed poppet valves for steam admission and exhaust, actuated by a crankshaft mounted eccentric driving a rocking shaft which in turn pushed the valves open/shut during operation. The valve mechanism on the Margaret S. is similar, however modifications were developed to be more compatible with the smaller scale of the engine. Slide/Piston type valves are used rather than poppet valves, as slide valves are almost always found on steam engines of smaller size and higher speed, such as factory mill engines, steam locomotive engines, etc. 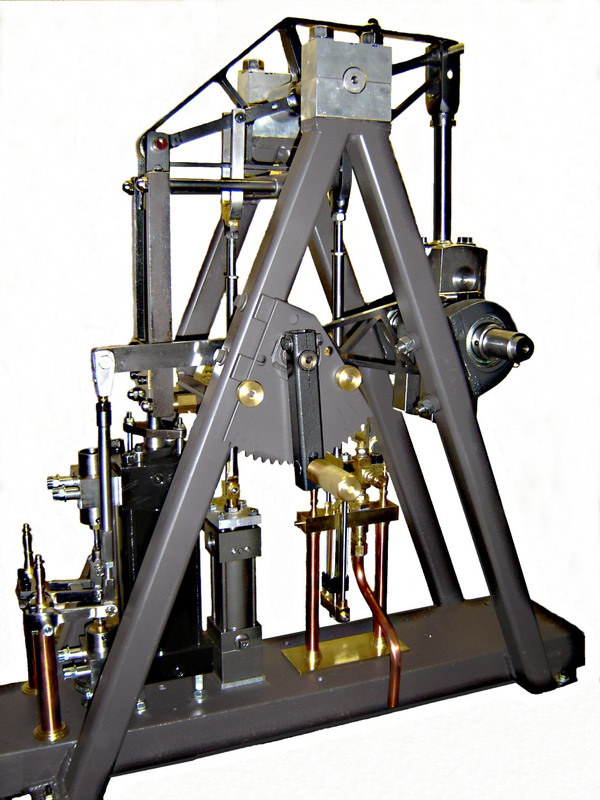 The valve gear for the Margaret S. copies the design of the Marshall-Bremme pattern, which was popular on screw propeller steamers in the late 19th century. This radial type valve gear allows variable cutoff in forward or reverse running, and uses no sliding surfaces for valve actuation. A traditional rockshaft transfers valve gear motion to the slide valves, approximating the appearance of traditional sidewheeler engines. Two reciprocating pumps are driven directly from rods connected to the engine’s walking beam. A single acting wet vacuum pump (1-1/ 2 inch bore, 2-5/8 inch stroke, 38 x 67 mm) maintains the engine exhaust pressure at sub-atmospheric conditions to improve efficiency when operating with a condenser, and removes condensate from the condenser hotwell. A smaller single acting feedwater pump (3/4 inch bore, 1-5/16 inch stroke, 19 x 33mm) is also driven from the walking beam, and forces water into the boiler continuously while underway. A second manually operated feedwater pump provides redundant machinery to assure feed to the boiler if the main engine is stopped, or if the engine driven pump is out of service for any reason. Either feedwater pump is capable of supplying 100% of the maximum required boiler feed rate during normal full speed cruising. A simple vertical firetube boiler supplies the steam, and is fired with Propane. Nominal heating surface is 20 square feet (1.9 Sq Meters). Original planning allowed for wood and coal firing, however the convenience of Propane firing has led to the intention of retaining this firing method. The boiler carries an ASME Code Stamp, and is designed for 250 PSIG (17 Bar) steam pressure. Burners from a gas fired house heating boiler are fitted, and these burners are silent. The engine directly drives two 44 inch (1066mm) diameter paddle wheels. The original arrangement uses common fiberglass lunch trays, cut in half to 12 inch wide (300mm) by 8 inch (200mm) high, as paddle floats. These trays were selected so that the wheels could strike submerged objects and break without damaging the machinery, and they are easily replaced if required. Fully articulated paddle wheel mechanisms have since been fitted, and simple slip clutches on each drive shaft protect the engine from possible damage if the wheel should strike a submerged rock or other object. The articulated wheels are more efficient, but require 72 pivot joints exposed to the sea water whilst underway. A flat bottom hull, similar to a historic "New Haven Sharpie Hull" was constructed of marine plywood. The relatively narrow beam of a Sharpie suits the sidewheeler well. The boat is carried by trailer on the highway, and the extra boat trailering width associated with the paddlewheels and paddleboxes dictates a narrow hull beam. Cruising at a nominal 4-5 MPH (6 - 8 kMeter per hour) the boat is stable and dry. Docking a sidewheeler is often difficult, with the paddlewheels exposed to damage from the dock in rough or wind conditions. The Margaret S. is fitted with "fold up" stern rudders, and the boat can be backed up to a beach with no dock whatsoever. Passengers can step off the boat onto dry land easily with this configuration. The flat bottom, along with paddle wheels that do not increase the boat`s draft, allow operation in very shallow water. The Margaret S. can explore shallow coves and streams where other steamers (with large propellers and draft often 40 inches (1 Meter) or more, dare not go. Propeller and shaft fouling with underwater vegetation/grass is often the nemesis of steamboat excursions. With the relatively low power of our steamboats, a propeller shaft jammed with weeds can cripple a boat, requiring an underwater visit by hearty crew member to remove the weeds. The paddle wheels do not generally have this problem, and if any vegetation does attach to the wheels, they can be cleaned without an underwater visit. Hull Construction is conventional frames and marine plywood, covered with heavy fiberglass cloth and Epoxy. Hull overall length is 19 ft - 3 in (5.9 Meters), beam is 5 ft - 0 in (1.5 Meters), depth of hull is 2 ft - 0 in (0.6 Meters). Draft is about 8 inches (0.2 Meter) with a displacement of 2200 pounds (1 Metric Ton). Sturdy canopies are fitted on both the forward and aft passenger spaces. These can be put up for rain and sun protection, or folded down to provide some protection from waves and rough weather if necessary.